Escamilla Entertainment is proud to offer the professional exhibition of the traditional art of Trick Roping also known as “Floreo de Soga” by none other than the National Champions of the Art of Trick Roping "Los Hermanos Escamilla". Floreo de Soga is traditionally known as National Sport of México. 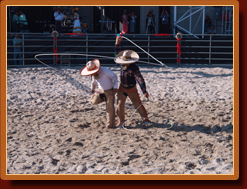 We offer authentic entertainment with a touch of the traditional Mexican Charreada which highlights the most exciting rope tricks. The Charreada (Mexican Rodeo) consists of several different feats including Riding (when available), Roping, Accuracy, Courage and Style. Our trick roping exhibition is designed to highlight the most exciting components of both Western rodeo and the Charreada (Mexican rodeo.) The show consists of world winning roping tricks and maneuvers done with up to 6 ropes at the same time. By 1975 "Los Hermanos Escamilla" had become the best "Floreadores" (Lariat or Trick Ropers) of México City. Their ability in maneuvering the trick rope art took them to share theatre stages for long running seasons with many of the top known artist of that time. Their fame in the entertainment environment opened many doors for them to be able to participate in late night style TV shows and opening for many entertainers. In 1978 they are called upon by the Ballet Folklórico de México de Amalia Hernández in which they participated as exclusive artists for that dance company until 2006. Los Hermanos Escamilla made appearances at the beautiful Palacio de Bellas Artes in México City to accompany the Ballet Folklórico de México during many seasons. They not only toured throughout all of México but also across continents in Europe and the rest of the world. In 1980 they are called and invited to participate with some of the best companies of Folklore. They then go to become part of one of Mexico's greatest artist performing and executing stunts not only on foot but also as part of the equestrian show for Mr. Antonio Aguilar. Los Hermanos Escamilla have performed for celebrities like George Bush Sr., Mikhail Gorbachev, Queen Beatriz of Holland, the king of Saudi Arabia, just to name a few. They have also represented México in many great tournaments such as Equestrian Olympic Games in Calgary and Holland. Their talent has been enjoyed at events in Madison Square Garden in New York City, the Astro Dome in Houston, Texas, and for 3 consecutive months performing along side Liberace at the Las Vegas Hilton. Los Hermanos Escamilla spent 20 Years with the Ballet Folklórico Nacional de Silvia Lozano, performing at the ecological park Xcaret in Cancún México. The also spent 3 years in the Acapulco Guerrero México Convention Center, and for 15 years the performed every night in what is known as the Cathedral of Folklore in México City La Plaza de Santa Cecilia.